Texas-based ballistic armor retailer AT Armor, LLC –a leading supplier of high quality US made body armor packages for North American law enforcement and military communities, has announced that the first entry in a new proprietary plate carrier system – the Active Shooter Response Carrier – is now available for purchase. 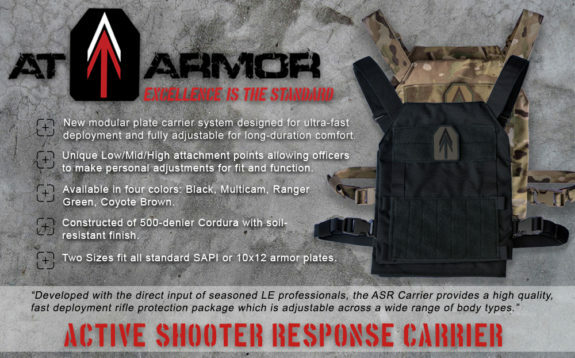 Developed with the direct input of seasoned LE professionals the ASR Carrier provides a fast -deployment rifle protection package for departments of all sizes. 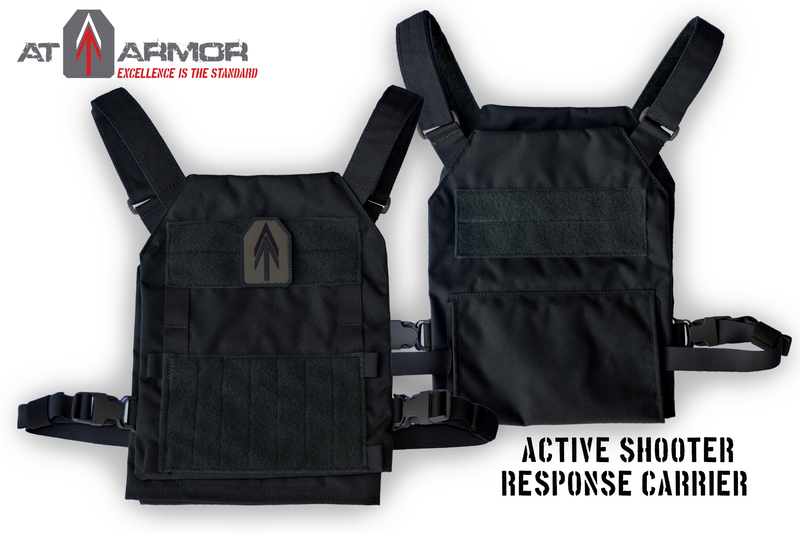 AT Armor purpose built the ASR plate carrier to be scalable and adjustable to provide a high quality solution for departments which pool resources for multiple officers. The ASR Carrier is a scalable, modular plate carrier system designed for fast deployment and fully adjustable for long-duration comfort. The unique attachment system offers multiple anchor points so that officers can tighten or loosen the carrier very quickly, and select the low/mid/high mount points to account for equipment placement needs and personal fit preference. The carrier has the ability to accept aftermarket or upgraded cummerbunds so the end user still has the option to add to the carrier to meet their individual requirements. Material: Constructed of high-end 500-denier Cordura with a soil-resistant finish. Colors: Available in four colors – Black, Ranger Green, Coyote Brown, and Multicam. Fit: Two Sizes (SM/MD and LG/XL); fits all standard SAPI plates as well as any 10×12 armor plates. Attachments: Low/Mid/High attachment points allow officers to make personal adjustments for fit and function. 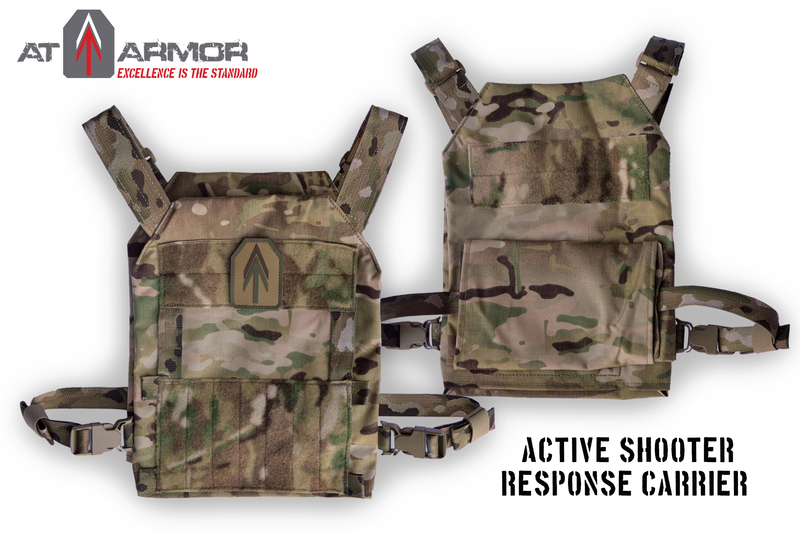 For more information about the new AT Armor Active Shooter Response Carrier, or to request quotes for department bids or contracts, please contact the AT Armor team at info@atarmor.com or visit the website, www.atarmor.com . Established in 2012 and located in Keller, Texas – AT Armor (https://store.atarmor.com) is your best resource for armor plates, soft armor, and side armor solutions, as well as protective headgear, plate and armor carriers and accessories for tactical and concealment situations, including the full line of Hesco ballistic armor protection. Our mission is to support US Law Enforcement, EMS and responsible US Citizens with the best protective armor sales, service and production education available.